To enable IPAM and Virtual Machine Manager (VMM) integration, you must first configure a user account for VMM on the IPAM server and then configure the IPAM network service plugin in VMM. When you have completed this procedure, see Synchronize IPAM and VMM for procedures to add a logical network using IPAM or using VMM and then view the network using either console. Membership in the Administrators group, or equivalent, is the minimum required to complete the following procedures. Review details about using the appropriate accounts and group memberships at Local and Domain Default Groups (http://go.microsoft.com/fwlink/?LinkId=83477). 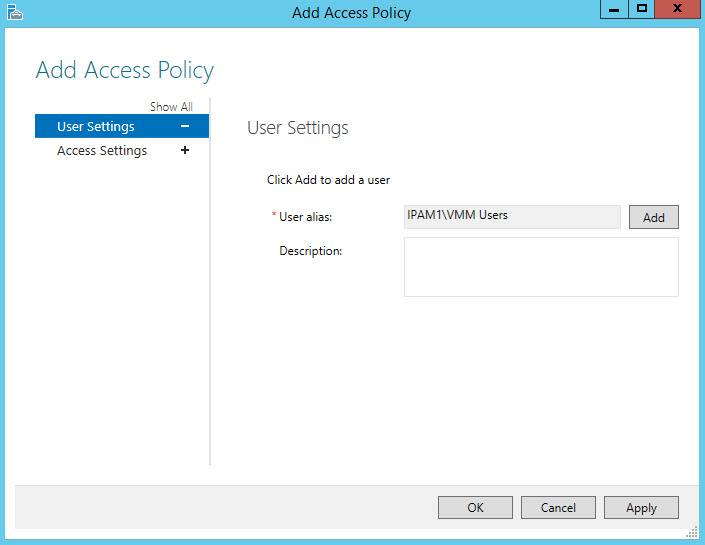 Use the following procedure to assign permissions to an account that will be used by VMM to access the IPAM server. Any local or domain account can be used, but it is recommended to use a unique domain account that will only be used by VMM to connect to the IPAM server. 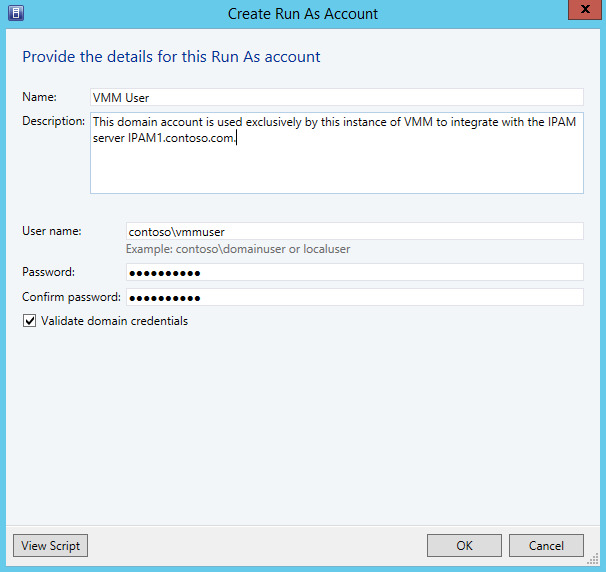 When adding this account to the IPAM network service in VMM, you must provide the domain\username and password. The procedure to create the domain account “vmmuser” is not shown here. To create this account, see Create a new user account. On the IPAM server, open an elevated command prompt, type lusrmgr.msc, and press ENTER. The Local Users and Groups console will open. In the console tree, right-click Groups and click New Group. In the New Group dialog box, next to Group name, type a name for the group, for example VMM Users. Click Add, and under Enter the object names to select, type the username of the VMM user account, for example vmmuser, and then click OK. 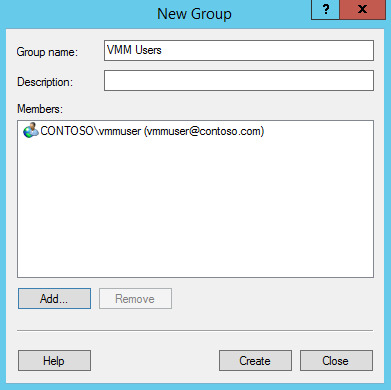 Confirm that the user account was added to the VMM Users group, and then click Create. See the following example. Click Close to close the New Group dialog box. Leave the Local Users and Groups console open for the following procedure. In the IPAM server console, in the upper navigation pane, click ACCESS CONTROL, right-click Access Policies in the lower navigation pane, and then click Add Access Policy. On the Add Access Policy page, click Add, type the name of the VMM Users group that was created in the previous procedure, for example VMM Users, and then click OK. See the following example. Click Access Settings, click New, and then choose IPAM ASM Administrator Role from the drop-down list under Select role. Verify that the Global access scope is selected, click Add Setting, and then click OK. In the Local Users and Groups console, right-click Remote Management Users and click Add to Group. Click OK to close Remote Management Users Properties. Click OK to close the Select a Run As Account dialog box. Click Next, and then on the Connection String page, type the fully qualified domain name (FQDN) of the IPAM server, for example ipam1.contoso.com. Click Next to continue. 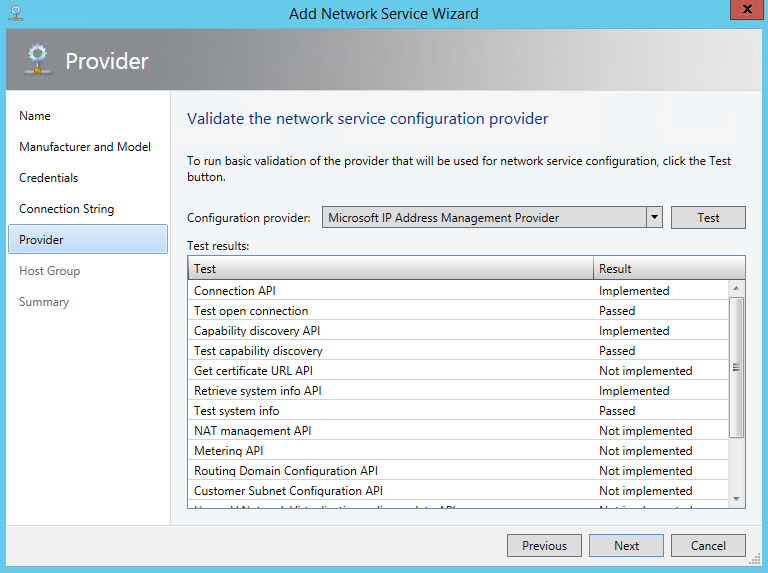 On the Provider page, verify that Microsoft IP Address Management Provider is selected next to Configuration provider, and then click Test. Verify that Passed is displayed next to Test open connection, Test capability discovery, and Test system info. See the following example. If one or more tests fail, verify that permissions are configured correctly on the IPAM server for the Run As account, verify the FQDN of the IPAM server is entered correctly on the Connection String page, and verify that VMM can resolve and connect to the IPAM server. Click Next, and then on the Host Group page select the All Hosts checkbox to enable IPAM integration with all logical networks in VMM. If you wish to enable IPAM integration for a subset of VMM logical networks, these must already be created in VMM. The available logical networks in VMM will be displayed on the Host Group page and can be individually selected for IPAM integration. Host groups that are not selected will not appear in IPAM and cannot be modified by IPAM. Click Next and then on the Summary page click Finish. By default, the Jobs dialog box will display status of VMM provisioning. Verify that a status of Completed is displayed next to Add network service device and Create new RunAs Account.